CMRL has introduced last mile connectivity for the benefit of Metro Passengers between Alandur Metro Station to DLF cyber city IT Park. There will be four tempo travelers plying between Alandur to DLF at an interval of 15 Minutes with a flat rate of Rs. 201-.The Vehicle is having air-conditioning for the convenience of passengers. The Feeder Services were inaugurated by Thiru L Narasirn Prasad, Director (Systems and Operations), CMRL and Tmt. 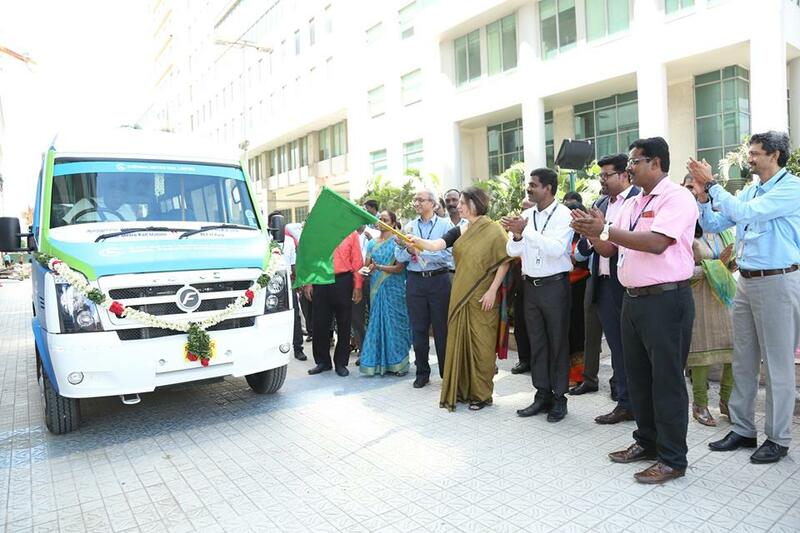 Uma R Krishnan ,CEO of Barclays inaugurated the feeder services from Alandur Metro Station on Monday (01-10-2018) at Alandur Metro Station and at DLF IT Park , Porur,Chennai. The vehicles will be available from morning 06:30 AM to evening 09:30 PM. Passengers can use this facility for boarding and deboarding between Alandur to DLF. Based on the acceptance and improvement, the some kind of service will be introduced in other metro stations. CMRL is requesting the Chennai public to utilize this facility to improve the public transport facility. There are already Cab feeder services are available at Anna Nagar East, Koyambedu, Vadapalani, Alandur, AG-DMS in the form of Cab at Flat rate of Rs.15/- in and around 3 km, there is Share Auto services available at Thirumangalam, koyembedu, Ashok Nagar, Ekkatuthangal, Alandur, St. Thomas mount, Guindy, Little mount at the flat rate of Rs.10/- for a distance of in and around 3 Kms. lnfosys Buses have been introduced from Alandur Metro Station to Mahendra City and Sholinganallur campus. A total of 6 trips are made in the morning, with 3 trips made each campus every day. In addition to already existing last mile connectivity to Metro Rail Stations, Several Bi-Cycle Schemes have been introduced at CMRL Metro stations for the benefit of the passengers and to promote a healthier and sustainable mode of transport. CMRL has introduced Bi-cycles for Last Mile Connectivity on Free of Cost with a refundable Deposit of Rs.3000/-. So far 95 Cycles are introduced at all 26 Metro Stations. A GPS enabled bi-cycle scheme by PEDL Bi-cycle Scheme by Zoom Can from October 2017 at 3 Metro Stations namely Thirumangalam, Anna Nagar tower, Anna Nagar East and 100 hours of free rides bi-cycle scheme by Athi’s Cycles from October 2017 at 6 Metro Stations namely Nehru park, Shenoy Nagar, Anna Nagar East, Thirumangalam, Vadapalani, Ashok Nagar have been provided at various underground and elevated metro stations have garnered an over whelming response from the Chennai Public for the above schemes. 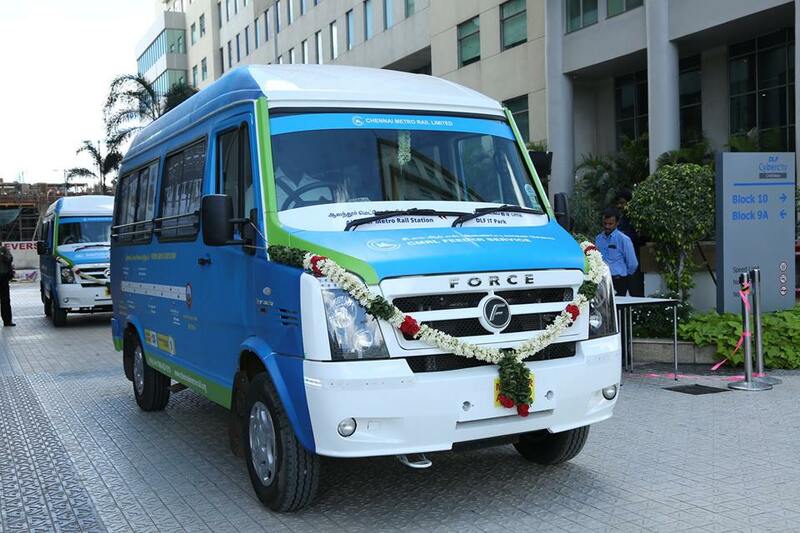 Mini Bus by MTC services are also available at Metro stations as last mile connectivity. The buses are available at Koyambedu, Ashok Nagar, CMBT, Alandur, Guindy, Nehru Park, and Central Metro Stations. Bikes are available for hire at metro stations for the convenience of passenger for the last mile connectivity. These Facilities are available at Thirumangalam, Shenoy Nagar, Egmore, and Airport Metro Stations. Apart from the above, Buggy services are available at Airport & Vadapalani and Walkalator connecting Airport Metro Station and Chennai Airport are also available for the benefit of the passengers.